After gearing up at the Nike Headquarters and getting a feel for the course, the Bolles boys were ready for fast and muddy competition come race day. Charles Hicks led the Bolles team going through the mile with a large pack in a time of 4:43. Hicks followed that 4:43 with a 9:44 two mile split to place 14th overall in a time of 15:16.3. 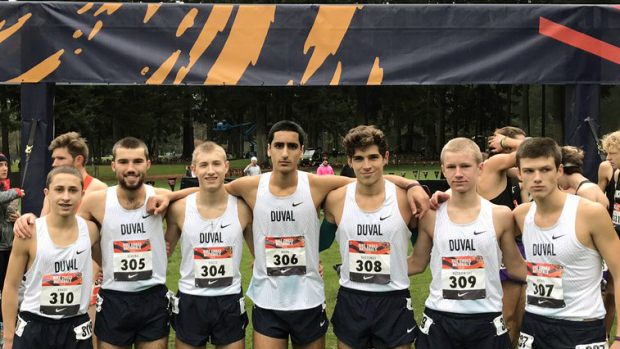 Ben Foltz and Chase Rivera were the next two finishers for the Duval squad in their 16:12.4 and 16:16.6 performances. Alex Hastings (16:25) and Kamren Khan (16:33) rounded off the top 5 seniors with William Brady (16:44) and Cole Rutkowski (17:01) running sixth and seventh for the team. Last year, the Bolles boys finished in 20th place, this year they improved tremendously with a ninth place finish to their name. The Bolles boys end their historic undefeated season with a ninth place national team finish, the highest in Florida history, and with an individual in the top 15.